I had this send over from someone that was reading the OQOTalk forums. I guess this is one from a design competition that I missed. Its obviously a rendering as I don’t think it’s physically possible to get a screen border that thin yet and the resolution looks way too high. It’s difficult to get a feel for the sizing of it too as there are no reference points on the image. If the membrane keyboard was soft-touch, it could be used nicely in one hand but it, somehow, looks too wide for thumbing. 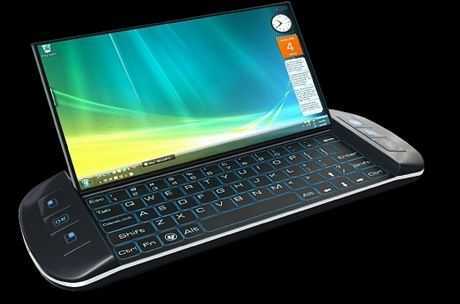 If you go for a membrane keyboard like that then you might as well use a touch screen instead. Then you can use it for different key layouts – if not a full screen, then something like on the Samsung Soul where the keys change depending on what is on the main screen. I personally think people aren’t being inventive enough with batteries. You can mould them to any shape. Excellent I think designers .. got it! That general format (side shoulders with general use buttons (dpad, things like that), slide and tilt screen, thumb keyboard) is what I’d like to see in a pocketable. As a general concept I like it, but I’m not sure about the specifics. Like someone else pointed out, what about the battery? or what about expansion ports (where are they? what kind are they?)? What screen size is that really and what resolution? and as you pointed out, what is the overall device size, since we can’t tell from that picture. If it’s not a pocketable, then I have no idea. If that keyboard is the size of the Everun Digital Note, or even an EeePC… ok, that might still be an overall small enough device that I could think about carrying it. But if it’s the size of, say, Apple’s macbook keyboards… Hm. I’d have to think about that. It might still be a nice and useful device, but at that point I think it’s more of a standard laptop convertable tablet, than an ultra-mobile (whether you’re talking UMPC or pocketable). That one (posted at “pocketables”) isn’t, no. Or, at least, it looks like you’d need a big pocket :-) But if the one posted here has a keyboard the size of an N810, then it could be pocketable. Maybe even if it’s slightly larger. But, the keyboard on this one doesn’t look like it’s laid out for thumbs (nor do the keys look like they’d be thumb friendly, if the overall keyboard was thumb size). So, it’s probably not a pocketable. Don’t care about the bad design attempt but the link to pocketables made my day. Design itself is excellent although I also doubt if the screen is possible physically. Anyway, it’s one of the best design I’ve ever seen recently. On the screen, how far from reality are those flexible screens? I’m sure that with them the screen part of this design would be feasible. It appears that the progress within the screens is moving a lot faster than progress on batteries? They do mention WiBrain there do I don’t know!? Very good design. Maybe the battery can be on both sides(kinda like a split battery), but this looks buyable. Whom wants thumb keys! I want a touch type keyboard UMPC but want it narrow enough to carry in a jacket pocket. Thus if that was about 7.5″ long by 4″ in depth and about 1″ in height that would be my dream machine! I personally see no value in the sloped sides around the keyboard as it you made it touch screen then there would no need at all and the device could end left and right where the keyboard stops. But in the Sony Vaio P sleekness factor? I’d could go for an Jornada sized Vaio P myself yes. But you know when I start to look at your numbers 7″ (~178 mm) thats about 9-10″ LESS than the Jornada in width. 4″ (~101 mm) deep and an inch thick (25.4 mm). I am sorry but those measurements (if you want something thats anywhere touchtype-able) would again point my eyes back to the UMID MID, which is 158 x 94.1 x 18.6 mm out of which the last number the thickness is a bit off in the widest end, it’s about the thickness of a nickel (21.21mm) in the thinner end but add about half of that in the thickest end, that would give you around an inch and a 1/4. Either way its about the SAME in WIDTH so…UMID MID would be close to what you want, no? Surprised that one isn’t on this site just for nostalgia’s sake. EC, the HP Jornada 720 series was actually 7.44 x 3.74 x 1.34 inches (189 x 95 x 34 mm); I’d like to see something about that size roughly. The Psion 5mx was the smallest at 6.9″ long that had a good touch type keyboard. Anything shorter would likely be just a thumb input computer. The problem with UMPC’s not being popular is the fact that there are no touch type keyboard pocket size form factors. If you need a computer bag to carry it most would opt for a more powerful sub or laptop computer. Pen input and thumb input just is not what most people want. Look at all of 2007 only 350k UMPC’s sold and 2008 was just as weak. Mainstream people prefer a normal keyboard NOT a thumb when working with full windows. They just want similar functionality of their laptop in a more mobile form factor and so far UMPC’s have not delivered anything most would buy. There IS an UMPC that has a full size keyboard. UMPC Portal even has it listed. 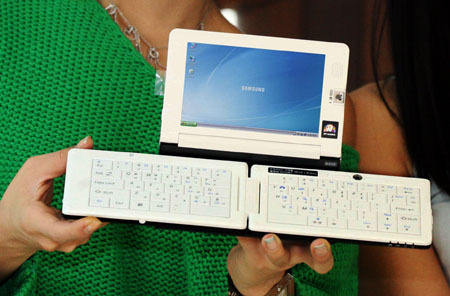 It’s a Samsung that has a full size keyboard that folds in half, and then slides behind the screen. 1) I do want a physical thumb-able keyboard, for quick and dirty typing and note taking, but it’s not totally necessary … I can probably hunt-and-peck on a netbook keyboard about as fast as I thumb type. A virtual keyboard is not good enough. 2) I want a screen that’s in the 7-9 inch range… smaller than that is too small for doing many things, and bigger than that stops being truly mobile for me, plus bigger than that means it wont fit in my gadget bag anymore ;-) ). 3) When it comes to typing notes in a meeting, or writing a LONG email (or long blog/forum comments), a thumb keyboard becomes annoying. I need a good touch typing keyboard. There are times where I’ve used a bluetooth keyboard, or an attached USB keyboard.. and that varies with the quality of the keyboard (4 row iGo == annoying for it’s re-use of keys, and has a wobble to it when you hit keys in one corner; samsung q1’s keyboard == great keyboard, but too big to put in my gadget bag). I don’t expect to do full speed touch typing on a 9″ netbook keyboard, though. I expect I’ll need a better foldable bluetooth, or to find a folding USB keyboard somewhere. Just have to wait and see. As for your request for Jornada sized more or less (and yes I messed up on the size comment of the Jornada!) and touch typing the UMID would really be close to what you’re asking for, now we will have to wait and see what it does with pricing and other such topics. That’s not to say your statement about touch typing vs. thumb boards isn’t accurate my point however is that A) This is changing at an “overnight” rate right now and B) I don’t think you can generalize like that as you’d have to take a look at ONLY the sector of “mainstream” that is using or thinking of using UMPC/MID/Smart phones. Very true but who is talking here about “most people” how many of of the 6.7 Billion or so are you including in your “most people” statement? maybe one could argue that MOST PEOPLE don’t even want a gadget or computer? I don’t know what MOST PEOPLE want to be honest, nor do you :) The sector of people even considering UMPCs (Lets just stick to calling the mobile computing devices that for simplicity) as a tool they’d want/use is a very small % of all people who use any type of computing device daily! >The problem with UMPCâ€™s not being popular is the fact that there are no >touch type keyboard pocket size form factors. I’m sorry but if this was true the iPhone (which by some definitions is an MID) would have been a serious flop with hardly any units sold. In fact as little as I personally would want it, *IF* Apple were to come out with an 4-6″ device (even without ANY physical keyboard) and with a FULL OS (be it then OSX and/or MS WIN capable) and with battery time anywhere close to the iPhone 3G it would be a HUGE HIT! 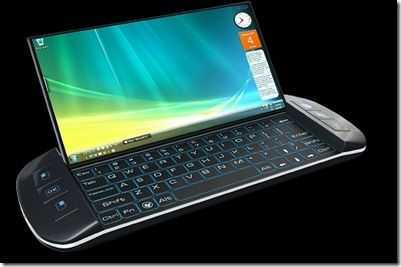 It is not a matter of just the lack of touch type keyboard, look at the huge amount of PDA’s and Tablet PC’s out there! Not everyone wants/thinks as YOU do, I’m sorry but it just isn’t so, if it were this site would be DEAD! Most of the devices ever covered by this site does NOT have touch type keyboards, in fact a huge % don’t have ANY physical keyboard (something I personally wouldn’t go for). The problem with UMPCs really is that they have been too high in cost, have been all too often marketed to a corporate customer base (again a lot due to price), and there hasn’t been much marketing to mainstream, you can go out there in just about any country with an OQO (even 01!) or Aigo or you name it, and when ppl see you have something you pulled out of your pocket that runs a full OS they are in amazement, try it or ask someone who has, I’ve done it on numerous of continents! The info isn’t out there really, nor are the products, the UMPC market is like you would have *ONLY* (for instance) the Nokia E90 on the smart phone market, and no other smart phone, how many would know of it? How many would pay that price? How many would settle for the size or no touch screen? I personally like what the E90 is, though it just isn’t what I need right now, though I just took it as an example to prove a point! The Samsung SPH-9000 is what he’s talking about, and yeah if all it took to make UMPCs a huge hit was a touch type KB then this or some copied solution would surely be out there with the masses already. >3) When it comes to typing notes in a meeting, or writing a LONG email (or >long blog/forum comments), a thumb keyboard becomes annoying. Anyhow it’s really a matter of what you’re used to, I prefer thumb boards, do long emails, blog posts (most on here) with my thumb board and take notes from several day long meetings. >I donâ€™t expect to do full speed touch typing on a 9â€³ netbook keyboard, >though. I expect Iâ€™ll need a better foldable bluetooth, or to find a folding >USB keyboard somewhere. Just have to wait and see. See that’s the thing though many (most?) of us here are wanting/looking for a FULL OS pocketable device I think most of us settle for the fact that in order to not sacrifice too much on mobility we MUST sacrifice SOMETHING else one being a full touch type keyboard. I mean there has been attempts with roll out, on table optical laser keyboards and everything in between, but none have really been huge hits. But can one say that about thumb boards? No they are HUGE hits though they all are different from each other with NO standard unlike your desktop keyboards where there ARE standardized layouts and what not. So within its OWN category (mobile keyboards) I’d have to say that thumb boards have been a GREAT HIT! I do 1000’s of txt messages a month, I used to use my N810 for lots of IMs and note taking in meetings, etc. And I _love_ my G1’s keyboard (best thumb keyboard I’ve used, both for feel and layout). But in all of those cases, I definitely had situations where I reached a threshold of “if I have to do anymore than what I’m doing now, I’m going to have to wait until I’m at a desktop”. And I’ve also crossed that threshold, where I’ve set aside what I’m working on until I could get to a desktop. Having both options in one device is what I’d consider to be the best. That’s why I hoped the Everun Digital Note would work out — small enough to thumb type, but big enough to do at least a little touch typing. Now I have to wait and see how I feel about the EeePC T91. Maybe it’ll have a virtual keyboard for light thumb typing, and I can use the physical keyboard for touch typing. And just to clarify, despite what I said about “if I do more typing than X, I need a desktop” (meaning “full size keyboard”), that doesn’t mean I find thumb keyboards inadequate … a thumb keyboard with a good layout and a good feel is quite usable, as long as I don’t reach that threshold of X. Though, I suppose the frog pad might be worth looking into as a mobile keyboard. C) Not too large, not too small and good tactile feel. What I would like to see though on the G1 is the keys being raised just a little bit more, they have a feel of being “worn out/tired/sunk in” for my taste, but that is just a taste I’d say! Other than that yes the G1 in my thumb boarding is #2 after the SKs also offered by TmoUSA, that is when it comes to KB alone. I do agree that full qwerty AND touch screen opens the possibilities to a lot more options. I have to say though that being on the go though I prefer button or say trackball over touch screen, don’t mind having it but use buttons when on the move. As for messages, I process (that is reply) to somewhere between 100-400 emails (and then all the postings online and various IMs and SMS) every 24 hours on my Sidekick, and they’ve held up incredibly well. It was only on the two first editions or so I kept wearing out the keys print but by that time I knew which key was what so I wasn’t needing any “print” on the buttons :) Since the past two generations that have the “print” INSIDE the keys so I’m safe now with my hundreds and hundreds of messages/posts daily. I was just thinking of this, this morning why I so eagerly use my mobile devices, I think it has to do with my decade of work in the corporate world, I really disliked the feeling of HAVING TO BE in a cubicle so much so that I still avoid to the extent I can the “having to” sit at a desktop :) I love being out and about and still connected and replying to various things. As for the rest of your “mainstream, touch type, normal keyboard, not thumb” comment I believe somewhere something got stuck on REPLAY and it appears to be senseless to reply to any further of your comments since you fail to provide any substance to your posts, you just make claims about everyone without really having the facts straight. I think most of us who are truely looking for a UMPC know and accept that it will be a thumbboard device, with SOME possibility to thumbtype in some instances. But generally speaking I don’t think we will see an HP Jornada sized UMPC anytime (soon), however much any of us would love to have one. I’d say out of all the options on the table or soon to be the UMID MID is the closest thing to what you’re hoping for though? Well to me that is why UMPC’s have been a failure so far. The form factor is just not practical to do any real computer work compared to a laptop. People want a touch type keyboard and many mobile people would sacrafice the screen size for a pocket version but only if the input was still a touch type keyboard, otherwise why buy one as then it would be toy not a potential laptop replacement when you really are mobile.? I won’t do that see my reply above. The one is the design of Filip Uhlir. The contest for was sponsored by Intel. piko, I liked the designs to me some do like possible devices more people like me would buy. EC, to me I think you are forgetting that we are talking about a full desktop OS as that is what a UMPC is supposed to provide. That really is much different than any Iphone, phone, pda; what people do with a full PC OS is to do their normal laptop functions for work etc. Thus that to me is why an input method that most people prefer is essential, namely a touch type keyboard. I am not talking about accessing the internet, as yes a PDA or phone will do that. We are talking UMPC’s with a full desktop OS which most want that full OS do to real computer work that requires what most prefer a touch type keyboard. For business users I do not see the price being the issue. I am a business person and for me the problem is since UMPC’s do not have the form to enable them to be a replacement for a laptop when I am really mobile most business people see it as a toy. Business people have no issues with the UMPC price but for what you get that is the problem, you get a computer with no touch type keyboard that often is still too large to carry in a jacket pocket so at that point you might as well get a sub notebook or laptop. The problem with Nokia is they use non standard OS. Most mainstream people use MS not linux or the Sybian OS. While I do think they make nice hardware the software limitations are often to me part of their issues. I do see thumb keys have their place for a phone but not for real computer functions; people are not going to gravitate towards prefering to type a report with their thumbs. I have seen the Samsung SPH P9200 and think it is great but you can not buy one and I have tried. I do disagree that if there was demand one would have been created. To me the companies making UMPC’s are the ones a bit clueless about mainstream needs. Why? Well they blindly followed MS all built similar 7″ slates right? Guess what after over a year there were very little global sales (2007 only 350k UMPC’s were sold, as cited by IDC in Forbes 12/07′). Now you would think if a form factor is not what people want then they would try something different right? but no. The computer companies made the same type of form factors in 08′ and for some dumb reason expected a different oucome. Guess what sales are still pathetic. I really think UMPC’s need to add another form factor. Something that has a full desktop OS, with a built in touch type keyboard, and when folded it will be small enough to fit in a jacket pocket. I do not think there is one form factor for all but clearly the current form factors are not generating much demand and I hope someone makes something more useful in the UMPC realm, thats all I would like to see. I think that this article of a potential new UMPC is nice in that it has what looks to be a touch type keyboard. To me if they eliminated the extra space around the sides of the keyboard the design could be jacket size? >EC, to me I think you are forgetting that we are talking about a full desktop OS as that is >what a UMPC is supposed to provide. That really is much different than any Iphone, >phone, pda; what people do with a full PC OS is to do their normal laptop functions for >work etc. >Thus that to me is why an input method that most people prefer is essential, namely a >touch type keyboard. >I am not talking about accessing the internet, as yes a PDA or phone will do that. We are >talking UMPCâ€™s with a full desktop OS which most want that full OS do to real computer >work that requires what most prefer a touch type keyboard. Again care to be more specific what kind of work you are talking about where thumb boards would not be suitable in your opinion? I take it you don’t access the internet on your desktop or? Here we go again “most prefer” where are you getting your facts or statistics, care to back these statements up with some FACTUAL EVIDENCE?! >For business users I do not see the price being the issue. I am a business person and for >me the problem is since UMPCâ€™s do not have the form to enable them to be a replacement >for a laptop when I am really mobile most business people see it as a toy. Your claim was that the UMPC’s haven’t taken off due to lack of keybaords, I CLAIM that a much larger factor is price and other factors I already stated. Now would you say the OQO has had great success? Well most will say no, however WITHIN the sector you refer to the business/corporate/professional user, they have been quite successful in fact! So the keyboard is NOT the hinder from it making it big! >you get a computer with no touch type keyboard that often is still too large to carry in a >jacket pocket so at that point you might as well get a sub notebook or laptop. TRUE because performance and/or battery performance has not been (still isn’t) up to speed to enable this, if you actually READ reviews and posts by users you will see that is the main issues, not lack of KB solutions! You really did NOT READ what I said, what I was saying is that the UMPC sector has NOT gotten the attention or marketing as SMART PHONES AS A WHOLE (there’s more than ONE smart phone out there you know!!) I was saying (as an example) that it would *AS IF* there would *ONLY* one Smart phone out there, take Nokia E90 for instance that isn’t so appealing to everyone (some love it however!). >I do disagree that if there was demand one would have been created. >To me the companies making UMPCâ€™s are the ones a bit clueless about mainstream needs. >Why? Well they blindly followed MS all built similar 7â€³ slates right? Wrong, you should read sites like this UMPCportal more in detail and listen to it’s podcasts you could get a more insight as to how the industry really works, and why certain designs come up as they do. > The computer companies made the same type of form factors in 08â€² and for some dumb >reason expected a different oucome. Guess what sales are still pathetic. >I really think UMPCâ€™s need to add another form factor. Something that has a full desktop >OS, with a built in touch type keyboard, and when folded it will be small enough to fit in a >jacket pocket. > the current form factors are not generating much demand and I hope someone makes >something more useful in the UMPC realm, thats all I would like to see. >To me if they eliminated the extra space around the sides of the keyboard the design ?>could be jacket size? What “extra space” are you hanging yourself over a computer generated image!? I am not trying to create a fight but I will attempt to be more specific. For me I need a full desktop OS to run applications for work only available for that OS; they are not able to work on linux or MAC. I want the mobile computer to have a touch type keyboard as I often need to generate reports, proposals and work with other programs where text input via my thumbs is very uncomfortable. I would love to see a UMPC enable me to do this in a form factor like the old handhelds so that I would not need to lug a laptop everywhere. You mentioned OQO and they and a few others proved that the technology is here right now to enable my dream computer but there is not one nor has ever one been created thus far. As far as OQO I read a local SF article which stated their sales and if you divide that by the lowest to moderate price configuration all you get is 8-15,000 units sold a year. I think the problem is just like my personal opinion of a full OS computer to me and others would be ideally to replace a laptop. To do that most whom need a laptop have to type a lot periodically so thumb keys would never work well. I think UMPC’s are a great technology but all I am saying is that thus far they have not been that popular and to me yes my opinion is that it is the lack of an adequate form factor that is jacket pocket in size that prevents many people like me from wanting to buy one. As far as what I was refering to about this picture, I meant the left and right sides of the keyboard. If the computer stopped at the keyboard and did not have those sloped sides which seem to waste a lot of space then I would think the design would be more compact and thus make it potentially easier to fit in a large pocket. Yes I want something not available nor has ever been created but I do see it as a large market and something more natural as a mobile form factor especially when the most people like the form of a laptop. Thus a pocket laptop but one that is long enough to have a good keyboard would seem the best use of this great new UMPC technology enabling a full laptop power to shrink into something so small as an OQO? FYI, OQO has never released/confirmed/denied any sales figures (I know this as I’ve tried to get some for a project in the past). That’s the facts. Why did you not just buy the Sharp D4 you were so “in love” with when it came out, you yourself were saying it was everything you’d been waiting for!? I think the only Ultra Mobile/sub-laptop type device that would satisfy you would be something similar to the Samsung SPH-9000/SPH-9200. Full size keyboard (that folds up behind the screen), but mobile tablet display. And that’s assuming you wouldn’t find the display to be too small. Unfortunately, as I said earlier, that device is only found in S. Korea. I think a 8.9″ or 10″ screen version of the SPH-9200 would be compelling for a lot of people. Or maybe a version of the HTC Shift that was big enough to have a laptop sized keyboard (and _no_ bigger), and that had an Atom or C7 CPU. Either way, though, it requires something that doesn’t currently exist. ” I just went to Conics.net and ordered the D4 with two extended batteries. I’d be curious to how many MILLIONS of these units were sold in the past quarter or so with the holidays and all? :) if this is what the “masses” and “millions” truely would be looking for I’d expect they would’ve swapped out the Japan only WWAN HW for some international one by now soon to be a YEAR after first showing it?! Oh don’t get me wrong MY favorite device I’m typing on is in fact a FULL QWERTY keyboard device made in Japan by Sharp ironically, and I wouldn’t mind the D4 myself except for size and a lot of (for me) wasted space around the screen. Point being however that a “touch type” keyboard on an UMPC just isn’t the missing link for full success of UMPCs. I think he is refering to the sloped sides on the left and right that have navagation buttons? I can see if those were gone it would be shorter and maybe more compact. For me I have not purchased one of these ultra PC’s. To me it is both about price and how they are designed. I would only buy one if I could use it to replace an aging laptop so yes I agree it needs to have a keyboard. Price is a factor as I can see notebooks of more familiar brands for $499-999. I think for these kind of computers they need to either be ultra cheap with close to the same power and/or they need to be smaller to carry them as Al mentioned. I can see arguments on both sides but I think so far I see no real ultra PC’s good enough to convince me to buy one. First, for me, size matters. It has to fit (along with some other things) inside my gadget bag. The main pocket of my gadget bag is 10in x 8in x 5in. Second, OS matters. It has to run something Unix/Linux based, with support from the hardware vendor. I would prefer Mac OS X, if it ran on a device that meets my other specifications, but it doesn’t (not with support from Apple). I may toy with a non-vendor supported Ubuntu variant (like Eeebuntu), but I don’t want to have to depend on it. Oh, and, among Linuxes, I’m not a big Suse fan. I haven’t tried Linpus, but I’m willing to. Third, input matters. It has to have a physical keyboard. A touch screen and tablet mode would be VERY nice (true tablet (like a Samsung Q1 Ultra), or a convertible tablet (like the EeepC T91), are equally acceptable). If it’s going to be a thumb keyboard, it has to be a good one, but I can live with that for a while. Fourth, display matters. It has to have at least a 7″ screen. The N810 is too small for me, for heavier/on-going work. This, combined with the gadget bag size limit, pretty much means 7″ screen or 8.9″ (9″) screen. So, the fact that I can get a full size laptop, from Walmart, for under $500 … doesn’t matter. It doesn’t have vendor supported linux, and it wont fit in my gadget bag. Either way it looks like you’re really looking for a Netbook or Subnotebook (don’t know if they call them that anymore) since you’re looking for “a least a 7″ screen” and physical keyboard (on an 7″ screened device we’re already really looking at quite a bulky device). The TC91 and Dell Mini 9 aren’t really UMPCs though, rather Netbooks. I’m not JM. In a way, my post was a response to JM, as in his last post he seemed to be more advocating a standard sized laptop, pointing out that netbooks don’t necessarily win on price (because you can get things like the Walmart special for the same price), so small/cheap/underpowered doesn’t seem to be justified to him. At least, that’s how I read his statement. Where I was pointing out: the fact that the walmart special is “cheap” isn’t good enough. It’s still “big” (within the realm of modern mobile devices). And specifically “too big” for me. So I was disagreeing with JM. And, to some extent, you’re right. I’ve used an UMPC, I’ve used two MIDs, and I’ve used a Netbook. And, what I find myself wanting is a convertible tablet Netbook. I gives me the tablet aspects of an UMPC and MID, and it gives me some of the more conventional aspects of a laptop, just smaller. I definitely don’t want to carry something the size of a 12″+ laptop. As for UMPC vs Netbook … I don’t think the terms have really retained a distinction. For me, a Netbook is a subcategory of the larger “Ultra Mobile Devices” category. MIDs are also a subcategory in the “Ultra Mobile Devices” categoy. As are UMPCs. Which one is a superset or subset of overlapping set of the others depends on who you talk to. I seem to recall that recently Intel said that they consider UMPCs to be a subset of MIDs… which is completely out of whack with what I consider an UMPC and a MID. For me, a MID is pocketable, with a desktop-ish/desktop-based OS, Wifi, and isn’t a phone (it might have WWAN for data, but not for non-VOIP voice calls, and I haven’t seen one yet that directly does SMS or MMS messaging … just indirectly via an IM protocol) (I don’t know whether or not there are any laptop shaped MIDs, but I don’t know that I would disqualify something from being a MID based on that). An UMPC is like a MID except that it is not pocketable, it has a screen between the size of a MID and a Laptop (for me, laptop is 12″+ screen size; so 5 or 7″ screen up to 10 or 11″ screen), and is not the shape of a laptop (it’s a tablet based design, like the OQO, Sony’s UX, or Samsung’s Q1/Q1U/Q1UP family), desktop-ish OS, Wifi, optional WWAN for data only. A Netbook is like an UMPC (not pocketable, 7ish-10ish” screen, desktop-ish OS, Wifi, optional WWAN for data only), except that it IS laptop shaped. A convertible tablet netbook, like the EeePC T91, is probably best described as being a hybrid of the UMPC and Netbook groups … or, if you consider the UMPCs to include laptop-shaped devices, then it’s just a variation within the UMPC group, as all Netbooks would be (under that assumption). So, for me, none of them is strictly a subset of the others; each occupies its own niche (MIDs == small, UMPCs == medium tablets, Netbooks == medium clamshells), and the T91 is a hybrid UMPC/Netbook. For Intel, all of the above are subsets of MIDs. And, of course, UMPCPortal covers all of the above (MIDs, UMPCs, Netbooks, and Convertible Tablet Netbooks). Anyhow yes it is very true that there is serious confusion or overlap if you want in the usage of UMPC vs. MID etc. * Optimized for office-use applications like Excel, Word, etc. As for UMPCs they were supposed to be 8″ and smaller screened devices. As we know a year ago Bill Gates introduced the OQO 02 in his keynote at CES 2007, this was then referred to as an UMPC, since it’s a FULL OS and under 8″ etc etc, despite it not having “regular” touch screen. I do own the Sharp and while I like the portability, I do not like the keyboard. The screen is remarkably clear and easy to view the real flaw is the keyboard and low battery life which is workable but not ideal with the extended battery. To me there is still a lot lacking in the UMPC market as far as a more useful form factor and that is why I think the sales are so small. As far as OQO, this article listed a sales number and if you just do simple math and be ultra conservative by using the average sale of $1300 when in reality most users probably bought accessories or added features to their order which often can make an OQO $1500- $2K +; 20 million divided by 1300 gives an annual sales of only 15,384. and if you assume accessories, etc. that number can go easily down to 8,000 per year. Hopefully they are still profitable but those are pretty small numbers on a form factor unchanged and marketed for 8 years. I do think the Samsung SPH p9200 would be the perfect UMPC for me as well as many others. I just wished they were available for purchase in the US or if someone would just copy that design and sell them in US and Europe. I just think UMPC’s have the potential to be huge but not without some more innovative form factors that enable them to be used in place of a laptop with a size when folded can be carried in a large pocket with not bag needed. How can that be, this is the keyboard that will bring “salvation” to the UMPC sector by your own comments!? >As far as OQO, this article listed a sales number and if you just do simple math..
As I’ve stated before and as I will state again OQO has NEVER confirmed (nor denied) ANY sales figures. The only number that SFGate published was “more than $20 million in sales” doesn’t say and EXACT number, nor from when the figure was taken, the article is from close to a YEAR AGO, and most likely based on numbers from 2006 that could be dug up by anyone, since OQO isn’t sharing their units sold figures with the public! As for your comment about “simple math” I’m not sure what type of reports it is you run at your place of employment but anyone who is familiar with the OQO company and product knows all too well that the majority of the products have NOT been sold to CONSUMERS at RETAIL prices, but to corporate customers buying in bulk and to resellers, hence there’s no “simple math” here! >on a form factor unchanged and marketed for 8 years. As for the intial OQO proto shown it was similar to the OQO 01 but NO KEYBOARD, so not the same form factor. But hey since the point was that TOUCH TYPE keyboards and not thumb boards is what will make the UMPC market sell like crazy, not how big or not OQO is. Bottomline is OQO is one of the strongest contenders within the UMPC market at this point in the 4-5″ screen TRUELY POCKETABLE size, however you twist it. If you listen to UMPCportal’s podcast during the CES you will hear my own comments about the OQO being outdated for me personally from an HW point of view, it hit me later that day that it is actually remarkable that OQO can show the same exact (ok 99%) HW as they did in 2007 at CES and actually get such attention as they did, and WITHOUT A BOOTH at that. Show me another device that looks just like it did at CES 2007 from CES 2009 that got ANY attention like this :) So I think OQO were pioneers beyond anyone else and deserves credit for that BIG TIME. Now you want touch type keyboards, I don’t (on my pocketable) only on a Netbook, and that’s that no need to consider one device or the other (or it’s users) better or worse for it, agreed?? Also there’s million and one other factors that play into what actually hits the market or/and makes it big, anyone who has ever had ANYTHING developed and marketed or/and sold will tell you this. “I suspect Primaz has been over at the SFGate article sowing his usual brand of Psion-centric anti-OQO rhetoric as “primadonna” or perhaps “MobileSalesMan” or perhaps both. I for one, really wish Primaz would just get himself a Sharp Willcom D4 and leave us all alone. We’ve listened to his endless rants, and heard his arguments. I don’t agree and believe most here don’t. So there we have it, it appears your agenda is not to be a mobilesaleman (or woman? :) ) but an “all-over-the-web-with-101-aliases-complainer”! So I’ll try to live up to my words now and start ignoring your “endless rants” to quote the OQOtalk forum members! I really wish the two of you would take your personal feud to a private discussion. There’s no reason for _either_ of you to continue with the back and forth and personal “but you said, once upon a time, blah blah blah”. I agree 100% and I am not taking any part in it any further! « Thanks to the CES bloggers.